The current to be measured flows through the 0.01 ohm resistor which causes a small voltage drop across the resistor. The 100 microamp meter is set up with the series 50 ohm and 500 ohm variable resistor in a voltage measurement configuration to measure this voltage drop. The 500 ohm variable resistor is used to adjust the meter’s full scale reading. The 50 ohm resistor limits the maximum current to the meter no matter what setting is on the 500 ohm resistor, this protects the meter from passing too much current and burning up. The series resistance of the meter, 500 ohm (or less) variable resistor and 50 ohm resistor should total 1000 ohms. 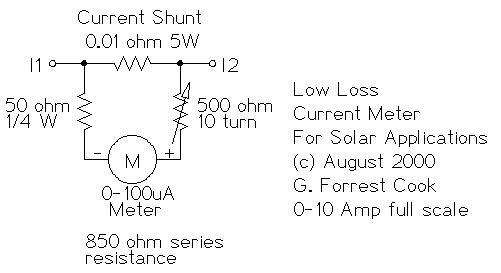 Different meters may require a different variable resistor to achieve the 1000 ohm value.